Premium Title™, a national provider of title and escrow services, announced today that it received the American Land Title Association (“ALTA”) Best Practices Certification from Pershing Yoakley & Associates, P.C. (“PYA”). PYA conducted the assessment and determined Premium Title attained a “pass” rating for all seven pillars outlined in ALTA’s Best Practices Framework: licensing, escrow accounting procedures, privacy and information security, settlement services, title policy production and delivery, professional liability insurance coverage and consumer complaints. Premium Title offers services that allow you to coordinate title insurance and escrow activities. Our customized solutions seamlessly integrate with your existing business processes and help you lower vendor costs, reduce title errors and reduce barriers to closing. Premium Title is part of the Altisource Portfolio Solutions S.A. family of businesses. For over three decades, PYA (Pershing Yoakley & Associates, P.C. ), a national professional services firm providing management consulting and accounting, has helped its clients navigate and derive value amid complex challenges. In addition to serving the healthcare and financial institutions industries, PYA serves the title industry with a comprehensive list of offerings, including ALTA Best Practices implementation and assessment, strategic planning, mergers and acquisitions, tax compliance and regulatory compliance. PYA’s steadfast commitment to an unwavering client-centric culture has served the firm’s clients well. PYA is ranked 91st by INSIDE Public Accounting’s “Top 100” Largest Accounting Firms. PYA affiliate companies offer clients world-class data analytics, professional real estate development and advisory resources, comprehensive claims audits for self-insured Fortune 500 companies, wealth management and retirement plan administration, and business transitions consulting. PYA assists clients in all 50 states from offices in Atlanta, Kansas City, Knoxville, Nashville and Tampa. For more information, please visit pyabestpractices.com or call us at 800-270-9629. Altisource Portfolio Solutions S.A. is a premier marketplace and transaction solutions provider for the real estate, mortgage and consumer debt industries. Altisource’s proprietary business processes, vendor and electronic payment management software, and behavioral science-based analytics improve outcomes for marketplace participants. Additional information is available at altisource.com. Source: Altisource Portfolio Solutions, S.A.
Jeremy B. Wilson, Esq., a co-owner of Clear Title, LLC, is pleased to announce the company has achieved a third-party certification, demonstrating compliance with the American Land Title Association’s (ALTA) Best Practices Framework. Recent regulations hold lenders liable for any deficiencies in a title company’s protection of consumer information. As a result, lenders are reviewing their relationships with service providers and becoming more sensitive to the types of companies with which they do business. To help lenders, ALTA created the Best Practices Framework to assist title and settlement agents prepare policies and to protect lenders and consumers. Clear Title, LLC, turned to national certified public accounting and consulting firm PYA (Pershing Yoakley & Associates, P.C.) to perform the third-party assessment and certification. Clear Title, LLC, is a Frederick, Maryland-based regional company that provides title and settlement services to the real estate community in Maryland. With over 40 combined years’ experience, Clear Title, LLC, has consistently provided title services to its clients. Through certification, Clear Title, LLC, has chosen to prove its continued commitment to premium service. To learn more about Clear Title, LLC, visit the company’s website at www.ClearTitleMd.com. For questions regarding the certification process, visit the ALTA website at www.alta.org/bestpractices. Clear Title, LLC, is a Frederick, Maryland-based company providing commercial and residential title and settlement services across the state. With 40+ years in the title business, Michele Lohoefer and Jeremy Wilson, Esq. have consistently provided thorough client-focused services. Clear Title is one of the leading local title companies in their area. For more information on Clear Title, please call 410-707-0053 or visit www.ClearTitleMd.com for title quotes and more information. Eugene McCullough, Title Industry Service Director at PYA (Pershing Yoakley & Associates), has been awarded the National Title Professional designation by the American Land Title Association. National certified public accounting and management consulting firm PYA is pleased to announce that Title Industry Service Director Eugene McCullough has been designated as a National Title Professional (NTP) by the American Land Title Association (ALTA). The NTP Program recognizes land title professionals who demonstrate the knowledge, experience, and dedication essential to the safe and efficient transfer of real property. 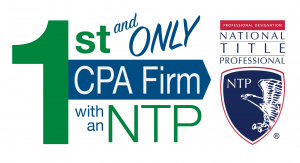 The NTP distinction demonstrates that McCullough has met the particular standards and criteria of the NTP Program. Selection for this designation was determined through an extensive application process in which land title professionals demonstrate their knowledge, experience, and efficiency in/dedication to the land title industry. According to ALTA, the NTP represents a measure of achievement and commitment to career development. A 35-year title industry veteran, McCullough has served in numerous roles including past president of the Tennessee Land Title Association (TNLTA), president of a full-service title insurance agency, regional president of a national title underwriter, and president of two regional title insurance underwriters. He is a long-standing member of ALTA and the TNLTA, where he chairs the Committee on Pre-Licensing Education. In addition to serving as PYA’s Title Industry Service Director, McCullough provides consulting and expert witness services to clients across the nation through his company, Title Experts and Management Services. Luxe Title Services, a regional title and settlement services provider based in St. Petersburg, Florida, recently achieved compliance with title industry Best Practices as set forth by the American Land Title Association (ALTA). As regulators have recently increased their demands for protective measures throughout title and settlement procedures, ALTA created the Best Practices Framework to help title and settlement agents prepare policies and procedures to protect lenders and consumers. Best Practices certification comes after a rigorous third-party assessment covering all areas of title and settlement services, including licensing, escrow trust accounting controls, privacy and information security, written policies and procedures, liability and fidelity insurance confirmation, and guidelines for customer relationship management. Luxe Title Services enlisted the assistance of national certified public accounting and management consulting firm PYA (Pershing Yoakley & Associates, P.C.) to perform the third-party assessment and certification. “Luxe Title Services joins a limited list of title companies that have achieved completion of a rigorous certification. We expect this certification will allow us to grow our services and better serve our associates and the real estate community,” said Robert Glaser, president and CEO of Luxe Title Services. With this certification, Luxe Title Services is now poised to demonstrate to consumers, lenders, and the industry its compliance with ALTA Best Practices. For more information, visit the Luxe Title Services website, www.luxetitleservices.com. Luxe Title Services is a locally owned and operated, full-service title insurance agency with offices in St. Petersburg, FL, and Tampa, FL. Luxe Title Services is focused on elevating the consumer experience in the real estate closing, title, and settlement process and related services to sellers and purchasers throughout the state of Florida. We are a leading title services company dedicated to providing clients with the best services available. We are committed to professional excellence while offering timely and cutting-edge services.